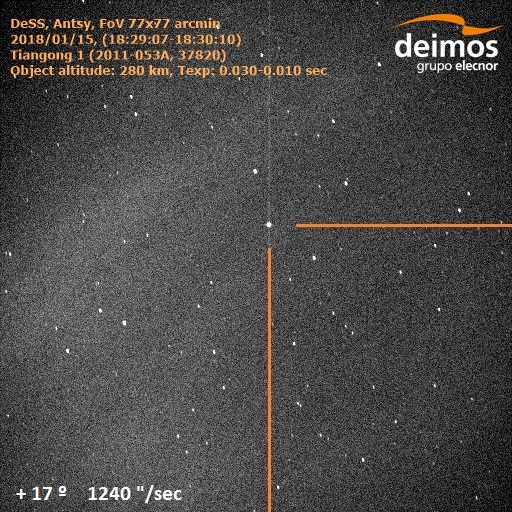 Editor’s note: Today’s blog post come courtesy of the team at the Deimos Sky Survey (DeSS), who use a high-tech automated observatory located on top of Puerto de Niefla, in Valle de Alcudia and Sierra Madrona Natural Park, in central Spain, south of Madrid. The location offers spectacularly clear skies and the observatory comprises three telescopes that are used for testing and development of software, systems and techniques for surveying asteroids and space debris, as well as actual detection and tracking of asteroids. The telescopes are operated remotely from a control room located at the Elecnor Deimos Castilla La Mancha facilities in Puertollano, about 35 km to the north. The Deimos Space Surveillance & Tracking team analysed the images, which were acquired in mid-January, when Tiangong-1 was at about 280 km altitude. The images were obtained by our robotic telescopes commanded from the Deimos Sky Survey control centre, and were generated specifically by the ‘Antsy’ optical sensor, which is adapted for tracking objects in low-Earth orbits. 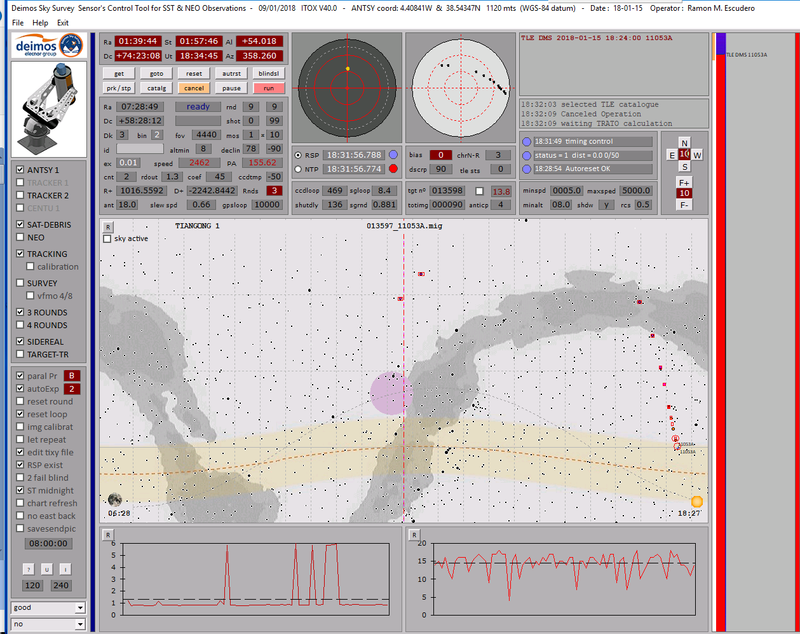 The imaging process is fully automated, both in the tasking of the sensor to point to the predicted position of Tiangong-1 and in the processing of the telescope images obtained. Due to the particular difficulties of observing an object at such low altitude, the imaging was monitored by an on-duty operator. Images were acquired on 15 and 16 January 2018, during the approximately 1-minute satellite pass over our DSS location in south-central Spain. We used very short exposures, down to 10 miliseconds. I just am checking on stuffin space and see that the station’s apogee is around 99 miles. It’s currently about to pass over spain within the hour and I’m just wondering if anyone out there can get a picture?